"No woman in the three-hundred-year history of the karyukai has ever come forward in public to tell her story. We have been constrained by unwritten rules not to do so, by the robes of tradition and by the sanctity of our exclusive calling...But I feel it is time to speak out." 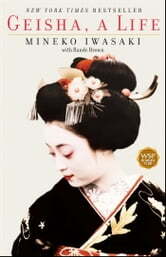 In Geisha, a Life, Mineko Iwasaki tells her story, from her warm early childhood, to her intense yet privileged upbringing in the Iwasaki okiya (household), to her years as a renowned geisha, and finally, to her decision at the age of twenty-nine to retire and marry, a move that would mirror the demise of geisha culture. Mineko brings to life the beauty and wonder of Gion Kobu, a place that "existed in a world apart, a special realm whose mission and identity depended on preserving the time-honored traditions of the past." She illustrates how it coexisted within post-World War II Japan at a time when the country was undergoing its radical transformation from a post-feudal society to a modern one. "There is much mystery and misunderstanding about what it means to be a geisha. I hope this story will help explain what it is really like and also serve as a record of this unique component of Japan's cultural history," writes Mineko Iwasaki. Geisha, a Life is the first of its kind, as it delicately unfolds the fabric of a geisha's development. Told with great wisdom and sensitivity, it is a true story of beauty and heroism, and of a time and culture rarely revealed to the Western world. A very good book - such an incredible life, told in an honest and straightforward style. Worth reading!